Good income, good tenants and good service. That’s what Landlords want, and it’s what we have been delivering for 40 years now. However, some Landlords get the ‘good income’ bit wrong from the start. They are seduced by disingenuous, high rental valuations and their property stays empty, losing money every day. Avoid voids is the golden rule in letting. ‘Vanity rents’ cost time and money and are only used to secure an instruction. 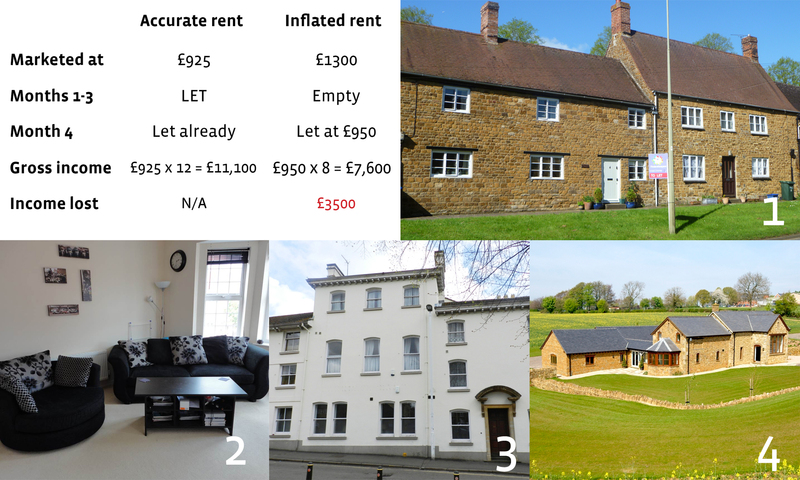 The box above illustrates the problem: we valued a modern 3 bedroom house for rent near Banbury at £925pcm in March. A local estate agent valued the same property at £1300pcm. They were instructed by the landlord and the property then sat empty for a staggering 4 months before it was finally let at £950pcm. A good agent uses recently achieved rents of similar properties to guide valuations and adjusts rent quickly to match demand. Photos 1 to 4 are homes we have recently let quickly. Photo 1 is a lovely 3 bedroom cottage in Deddington, which was let on the first viewing at £1100pcm to tenants who are keen gardeners – the owners are delighted. Photo 2 is a smart 2 bedroom, 2 bathroom apartment which the landlord had been using occasionally. We let it straight away at £695pcm and the landlord was even able to keep the garage for his own storage. Property to rent in Banbury centre will always let well. Photo 3 is a 2 bedroom apartment in the town centre, which let within a week to professionals at a rent of £850pcm. Finally, Photo 4 is a stunning 6 bedroom barn conversion which let on the first viewing for just over £3500pcm. The tenants are a couple who wanted to experience country living with spectacular contemporary interior. Over-quoting on rent levels is becoming more common as more estate agents try their hand at letting. If you prefer honest valuations, contact Paul Rushworth or Clare Poil on 01295 276766.